This page was written when the Alt Framework was still in the early design phases. It is intended as a guideline and introduction to what the Alt Framework could and should be. First off, thanks for browsing this web site. I will describe the Alt Framework, and with any luck, convince you that it is worth using. I started the Alt Framework after being grossly dissatisfied with existing web frameworks. Many recent frameworks seem to be designed to give instant results, but end up being both too simplistic and unnecessarily complex for serious projects. The frameworks also use languages such as Ruby and Python as a basis. I feel that they lack justification for requiring web administrators to install these frameworks. In just the past couple years, several technologies and concepts have exploded and become popular web design trends; namely content-presentation separation, and interactive AJAX/Web 2.0 applications. While neither concepts are new in the non-web programming world, few people had successfully integrated them into web programming. The challenge is to apply traditional programming patterns to the fast-changing world of web applications. After not being convinced by the numerous new web frameworks I decided to approach the issues as an academic exercise. All of the issues seemed to stem from one main problem: repetition. In computer science they say that any time you copy and paste something, you need to look for a better approach. Any time you have something repeated in multiple places there is potential for a bug, so there is logic in repeating yourself as little as possible. To solve this problem, the Alt Framework has three interconnected solutions. With web applications approaching client-server models, the need for shared code between client and server-side becomes more apparent. While client-side form validation creates a faster and better user experience, it is still necessary to validate the data on the server-side for security reasons. Web programming (and almost any programming) is not limited to just the program code. For any project of reasonable magnitude, it is often beneficial to export certain components of a program to a data file. This is useful for internationalization, program layout, and any kind of interface design. I find that people are either for or against XML. One cannot deny that it provides a simple approach to organizing data, and its connections with HTML make it useful in web programming. Modularity is a key requirement for elegant and easily maintained programs. It is important to not only modularize code, but data and design as well. PHP is an example of poor modularization. Not only is the function set spread out through a huge library of top-level methods, its file-based system does not encourage modular site design. Java is an example of good modularization. It has a hierarchal package system that is both used by its library and used by all but the simplest Java projects. The Alt Framework follows in the footsteps of Java, providing a hierarchal package system that is easy to use for small and large projects alike, while also making it easy to create extensions and libraries for projects based on the Alt Framework. Clarity: Code and forms need to be clear in functionality and design, intuitive. Simplicity: Less is more! Simple solutions whenever possible. Do not make things arbitrarily complex. Consistency: Use patterns across the board. If you understand one part of the framework, the others should be trivial. 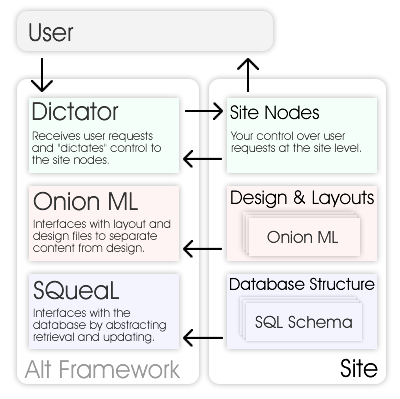 With those three points, let me introduce the three components of the Alt Framework: SQueaL, Onion ML, and Dictator. The user requests a page, the dictator is in charge of parsing the URI and session information before calling a site node. The site node can then refer to SQueaL to retrieve information from the database, or update it, while using Onion ML to format content to send back to the user. All database design is done in XML using SQueaL SQL Schema. Relational databases and means to access them can be designed in an intuitive, abstract XML format. Layouts, designs, widgets, and even limited content flow are all designed in XML using the simple yet powerful Onion ML (Onion Markup Language). These three systems work together to give you a complete functional web application framework. I am currently a student of Computer Science and have been developing web sites since 1996. Since 1996, much of web development has changed. "Browser wars" dictated the platforms for the web, server-side programming and dynamics have become a norm. In 2002 I embarked on my largest web application project yet, 2draw.net, an online art community web site. This site was written entirely in PHP with a MySQL back end and quite poorly designed. In 2003 I rebuilt the web site, developing a series of PHP frameworks to simplify and structure the design process. The Alt Framework presents some of my latest work with web programming.